Two days before his last day as CEO of DATCU Credit Union, Dale Kimble was bored. Not in a negative way, but more like someone who accomplished what he set out to and had nothing left to prove. Kimble, 65, will retire at the end of 2016. Current President Glen McKenzie will succeed Kimble as CEO of the Corinth, Texas-based credit union in January 2017. Since Kimble joined the credit union in January 2001, DATCU's asset size has climbed from $180 million to more than $865 million and its membership has doubled from 40,000 to a little more than 80,000 today. For 2014, DATCU was ranked as the 27th best-performing credit union in the nation by SNL Financial. In a Dec. 28 interview, Kimble said that in early 2001 DATCU was in a bit of a decline. The computer and accounting systems were antiquated, and the loan portfolio needed to be diversified. The credit union had four branches but no central office. Now, those back-office issues have been rectified, the institution has 10 branches and last year it moved into new headquarters. "Everything I wanted to accomplish once I got this opportunity I've accomplished," Kimble said. "I could sit here and do nothing for a good while, but I'm not wired that way. I need something to do." Richard Ensweiler, CEO of the Cornerstone Credit Union League, said in an interview that Kimble has done what Ensweiler hopes more credit union CEOs will do going forward by remaining extremely active in his community. Ensweiler said those leaders must become the face of their credit unions while spreading the word about the industry every day. "Dale Kimble understood that and was very active in Denton, Texas," he said. 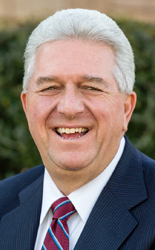 "Not many executives were as engaged or as well-known in Denton as Dale Kimble. That brought tremendous recognition and appreciation for DATCU Credit Union." Asked to name his biggest accomplishments, Kimble said he's proud that DATCU has been picked as the top financial institution in its markets for several years and that there has been consistency in customer service across all of its branches. Also, in January, DATCU will be handing out a bonus dividend to its members for the seventh straight year. When the credit union's capital position moved above 14% it decided there was no reason to continue to pile up more. Its goal is to keep capital levels between 14% and 15%, he said. "We're still a credit union. We're not a bank," Kimble said. Competition with banks has caused some credit unions to forget what their mission is supposed to be, Kimble said. He said credit unions used to work together but are increasingly treating each other as competitors. "Credit unions are getting into each other's backyards, which makes it harder for both of them. It's just a fiercely competitive, overregulated environment now," he said. Banks want to "run credit unions out of business" not to drum up more business for themselves but so they can raise loan rates and lower deposit rates without competition getting in the way, Kimble said. In his view, credit unions are really no competitive threat to banks. Although credit unions have seen strong membership growth, their percentage of total U.S. deposits has not grown considerably. "We hold relatively few dollars of the nation's assets," he said. "But credit unions are necessary to keep the banks honest." Kimble said overregulation of the industry is putting a strain on smaller credit unions and leading to a growing number of mergers. "That saddens me because all credit unions serve a very specific need," he said. Regulation does not intend to hurt small institutions but in reality is doing just that, he added. Ensweiler said Kimble became a go-to guy for Rep. Michael Burgess, R-Texas, who serves the northern part of the state. When financial issues came across Burgess' desk, Kimble was often the first person he would call. And by becoming a significant player in the community, Kimble earned the confidence of many other politicians, Ensweiler said. Kimble has 26 years of experience in the credit union industry, the vast majority of which has been spent in management. Prior to joining DATCU, he served 10 years as president and CEO of Mobiloil Federal Credit Union. Kimble said it is hard to leave his post, but he is confident the institution is in good hands. He said he will miss interacting with DATCU's 200 employees and admits that walking away from his "baby" will take some getting used to. But he said it is simply the right time for someone else to take the helm and the accompanying benefits and challenges. "I've often seen in sports and other places where people have stayed around too long, and that's not a good thing," he said.